We meet at 10.00am every Sunday to celebrate God&apos;s goodness to us through praise and worship, and to hear teaching from His Word, The Bible. There are activities for children and teenagers also. We meet at The Alpha Centre. 11:00am – 1:30pm at the Alpha Centre. Two Course Meal for £2. 9:00am-12:00pm. Open to the Public for a cuppa cake and a chat. 10:00am-11.30am for Parents, Carers and Tots 0-4 yrs. £1 per family (inc. drinks). Everyone is invited to meet together at 7.30pm each Wednesday evening during term time for Bible study, worship, fellowship and to pray for one another, the church and world issues. The children from school years 7 to 13 meet together on Sunday mornings and Friday evenings (at 7pm) to learn more about the bible, encouraging them to live their lives following Jesus, stepping up to the challenges of effective leadership. Contact Rachel for further details. 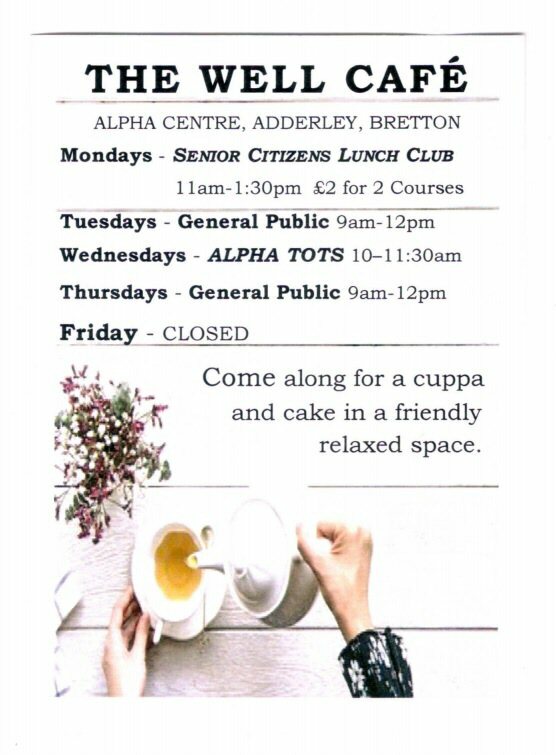 The next S4G Friday dates are: 3rd May (at The Alpha Centre Adderley Bretton), 17th May (at The Alpha Centre Adderley Bretton), 31st May (at The Alpha Centre Adderley Bretton). 10:00am to 12:00pm once a month. A time for the women to share fellowship together. See Rachel or Heather for details.